Dragon's blood (Xuejie)-Daemonorops draco Bl. Botanical Name: Daemonorops draco Bl. Part Used & Method for Pharmaceutical Preparations: The red resinous secretion from the fruit and stem is collected during the summer. It is heated or steamed into a solid resin, then pounded into powder. Properties & Taste: Sweet, salty and neutral. Functions: 1. To stop bleeding and promote the healing of wounds; 2. To invigorate blood and remove stagnation; 3. To stop pain. 1. Hemorrhages due to external injuries. Dragon's blood (Xuejie) can be taken alone for external use, or it can be combined with Cattail pollen (Puhuang). 2. Chronic ulcers. 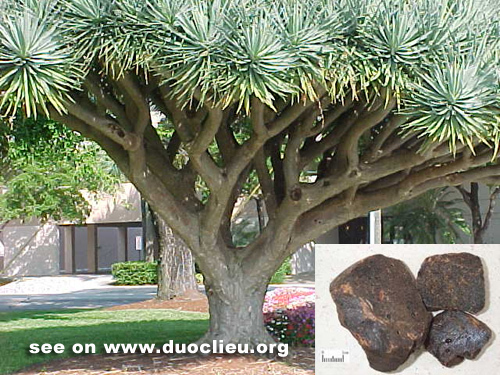 Dragon's blood (Xuejie) is used with Frankincense (Ruxiang) and Myrrh (Moyao) for external use. 3. Swelling and pain due to blood stagnation caused by external injuries. Dragon's blood (Xuejie) is used with Frankincense (Ruxiang) and Myrrh (Moyao) in the formula Qili San. Dosage: 1-1.5 g in pill form. Cautions & Contraindications: This herb is contraindicated in the absence of signs of blood stagnation.